Written by webb valarezo on Wednesday, August 20th, 2014 at 9:09am. 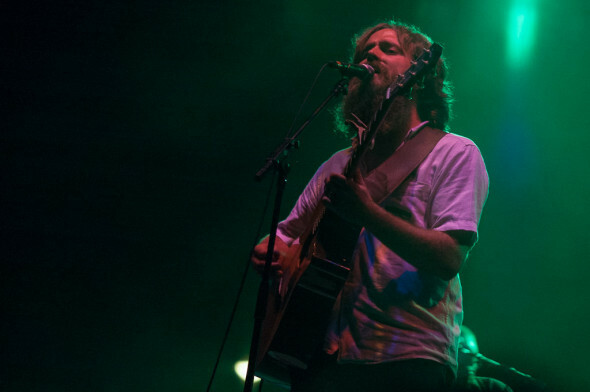 There was romance in the air last Tuesday night at Humphreys as Iron & Wine (aka Sam Beam) serenaded the crowd underneath the brightly lit sky of the fading supermoon. As palm trees quietly creaked in the cool breeze, an eager and smitten audience soaked in as much of the beauty emanating from the stage as they could. It seemed a little silly and playful to start taking requests after the first song, but when he finished the second song and asked for more requests and then again and again, it became obvious that this was going to be a very different kind of concert. By throwing out a set list and engaging the audience to see which direction they wanted to take the show in, Beam was able to make the sold-out Humphreys venue feel intimate. As a result, the ensuing set felt spontaneous and downright special. And, on its end, the San Diego crowd did not disappoint. For one thing, not once did someone yell out “Free Bird.” In fact, most of the requested material predated Iron & Wine’s breakthrough album, Our Endless Numbered Days. Beam seemed genuinely surprised and appreciative of the older material being requested and played it all gratefully. So the set ended up consisting of some of his darker, more Southern and gothic-sounding work. It made for a strange juxtaposition: this bearded Southern man singing these foreboding, sultry songs one minute and telling amusing anecdotes about his children the next. The latter included stories about taking his children to school or how hard it was for him to find an appropriate song to play for his daughter’s class on career day. The only breaks in the requests came when Beam wanted to play some new material. No one in the audience had a problem with that, especially since the new stuff sounded so damn good. After Beam finished the set, he quickly returned for a modest three-song encore, ending the evening with one of his most beautiful songs, “My Lady’s House.” The romantic tune was an appropriate way to end such a big ole love fest of an evening.